Frickley Athletic's Westfield Lane ground. Frickley Athletic spring back into action after 10 days off when they host Belper Town in the Evo-Stik League's East Division on Saturday. Disappointing recent results and a weekend without a game has left the Blues down in 13th place in the table and they are expecting a tough challenge against opponents higher than them in the league. Frickley are obviously looking to make their way back up the table and have been boosted by the return from injury of Sam Liversidge. They can also include Sam Cable following the forward's return to the club last week. But they will be without suspended duo Jameel Ible and Richard Patterson following their unfortunate red cards against Morpeth Town. 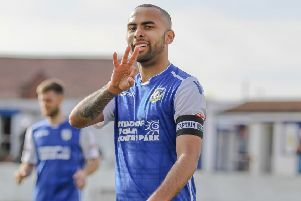 Three players have also left Frickley on permanent or temporary deals with Johnathan Williams joining Lincoln United, Jamie McGuire going to Scarborough on a month’s loan and Dan Palmer heading for FC Bolsover to aid his development – the Blues still retaining his registration. Manager John Stancliffe admitted it was frustrating to lose his two players to suspension just when he was getting closer to a fully fit squad. He said: "The selection pressures don't ease because we've got two players missing for the next three games on suspensions after the Morpeth game. "It's frustrating because from our point of view - I've seen the replays - we don't think they are red cards. They can both count themselves very unlucky and I've spoken to them about that. "But unfortunately that's football and the level we're at, we don't get the TV coverage that we deserve to get to turn things in our favour. "But we've still got a good squad, there's players who will come in and get a chance and I've got a 100 per cent belief that they can do the job at this level for us."